There are many tooth-replacement options available to your dentist these days, but unfortunately none of them offer the same level of functionality and aesthetic quality that dental implants in Orange Park do. When you’re trying to get the best bang for your buck and solve multiple dental issues simultaneously, dental implants can pull them off seamlessly. When you think about it, it’s like you’re having a cosmetic treatment and a restorative treatment performed at the same time. To make things simple, your dentist gives three reasons why dental implants are the right investment for improving your mouth. When considering aesthetics, dental implants truly have the most lifelike appearance. Now, every time you know you’re taking family photos or you’re making a notable appearance at a work event, you can flash your smile with newfound confidence. People who smile more are actually seen as more attractive and trustworthy than those who don’t, so with a new smile to show, you just might reap the benefits right away! Dental implants in Orange Park are nothing like dentures which can come loose or even fall out, causing an embarrassing situation you’d rather avoid. Your friends and family won’t even be able to notice until you tell them, which after treatment you’ll probably be so excited to do so. Your dentist wants you to have the life you’ve always wanted, and dental implants make it that much more enjoyable to do. 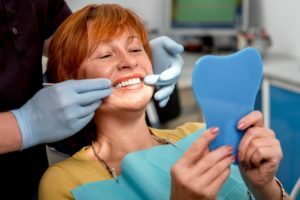 While dental bridges and dentures can work for a little while, they’ll eventually need replacing since they aren’t as durable or long-lasting as dental implants. Eating, talking, and laughing, are all very simple tasks you perform on a regular basis. These can be inhibited by the regular use of dentures, especially if they’re about ready to be replaced or relined. Now, you can eat the foods you eat and laugh with loved ones without worry of prosthetics becoming damaged or shifting in the process. Dental implants are cared for just like regular teeth, even though they can’t get cavities like natural teeth do. Just brush and floss like you did before and as time goes on, you just might forget you have dental implants at all! With missing teeth comes three main health concerns that dental implants can address: bone resorption, weakened muscle, and a changing facial shape. When teeth are missing in the mouth, your jawbone starts to shrink because it’s no longer being stimulated. Blood flow also ceases, causing the muscle in your face to weaken and make simple tasks like chewing more difficult. You’ll also notice your face begin to sag as it no longer needs to support teeth. With the help of dental implants from your dentist in Orange Park, there’s hope in addressing all of these problems. Schedule a consultation with your dentist to learn your edibility for dental implants. Dr. Matthew Nawrocki earned his Doctor of Dental Medicine degree from the University of Florida College of Dentistry. He then completed a one-year fellowship in prosthodontics and eventually earned a certificate proving his specialty in the dental discipline. Soon after, he became board-certified eligible. To learn more about dental implant treatments and his practice, contact him at (904) 272-1588 or visit his website.